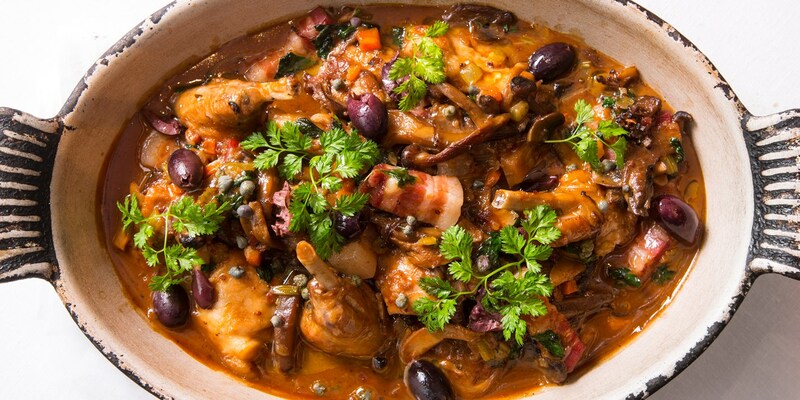 A peasant dish that’s fit for a king, rabbit stew has long been a mainstay on menus across Europe – think Coniglio alla cacciatora (hunter’s rabbit stew) in Italy, Estofado de conejo (rabbit stew) in Spain and Lapin à la cocotte (rabbit casserole) in France. Rabbit is also eaten in stews and tagines in Morocco and North Africa but it fell out of favour in the UK perhaps because we began to consider rabbits as pets rather than produce. Recently though rabbit is becoming popular again and this warming stew is an old classic. Because rabbit meat has a tendency to dry out during the cooking process, braising it slowly in liquid in this way guarantees an unctuous result with meat so tender it falls off the bone. Add the onion, celery and mushrooms to the pan and cook until soft and beginning to caramelize. Stir in the reserved flour and add enough wine to deglaze the pan. Return the rabbit legs and add the rest of the wine, the chicken stock and the thyme making sure the legs are submerged. Bring to the boil then reduce to a simmer, cover and cook on the hob for 60–70 minutes until the rabbit is tender. After 30 minutes, remove the lid to allow the liquid to reduce. If you are using diced rabbit rather than legs, reduce the cooking time to 25 minutes. This is a very simple recipe and can be altered and embellished – swap the thyme for rosemary or sage; use red wine instead of white or try cider; stir in some whole grain mustard towards the end of the cooking time; add some diced bacon or pancetta with the vegetables and so on. For a deeper rabbit flavour, replace the chicken stock with rabbit stock – ask your butcher for extra rabbit bones with which to make it. Copy our continental cousins – the Italians add ripe tomatoes or olives to their rabbit stews, the French prunes, red wine or brandy and the Spanish are partial to a generous glug of sherry and some Serrano ham. Serve rabbit stew with hunks of freshly baked bread or boiled new potatoes and seasonal green vegetables.